I'm loving a couple of things right now, one of which you've already seen. I smile every time I drink water at work now. The second thing makes my smile smoother. I initially balked at the $8.50 price tag, but Mr. Monkey told me it was worth paying an extra two dollars for the "flava." What a dork. The dork is right, though. My lips got flava now. Other objects of my affection -- everything at Green Zone. With every bite today, Bax and I kept asking ourselves, "Why is this so good?!" It doesn't matter how many times we go. It's a joy every time and worth another entry. 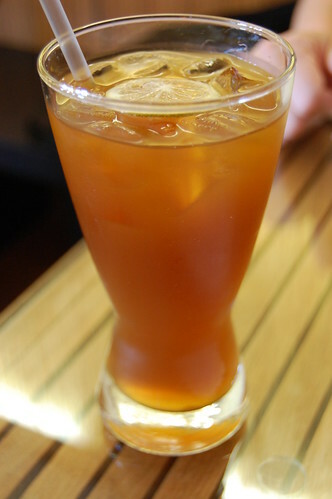 Of course, we drowned ourselves with the infamous passion fruit iced tea ($2.50). 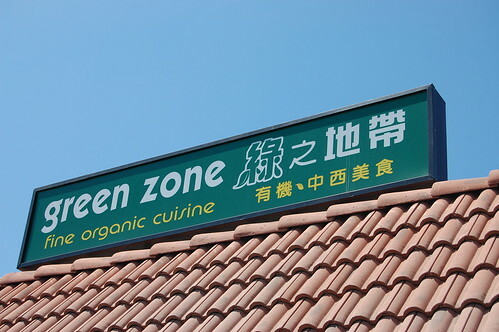 A visit to Green Zone is not complete without at least three glasses, preferably four. There is something magical in it, I swear. 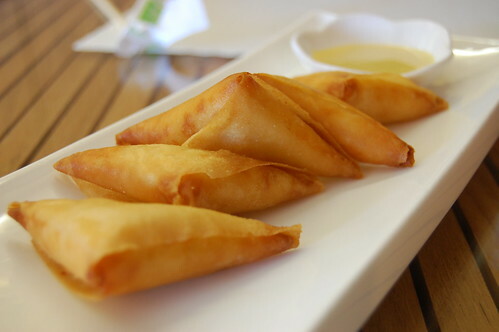 The salmon triangles ($5.95) are incredible. 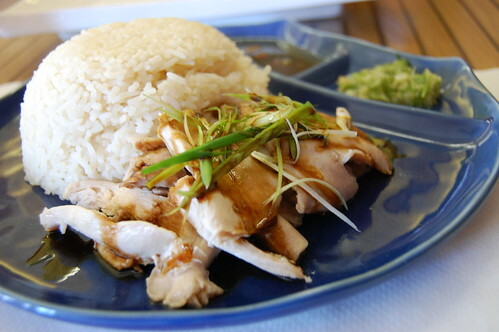 My organic Hainan chicken rice ($7.50) was delicious and light and made me feel good. 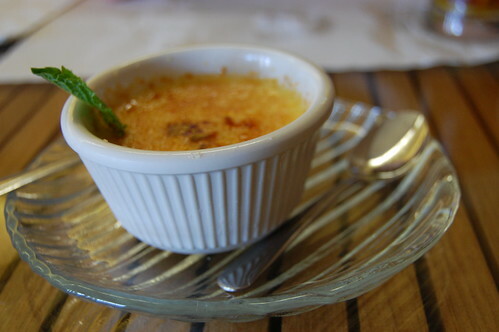 The lemon creme brulee was the perfect ending -- a classic with a little twist. 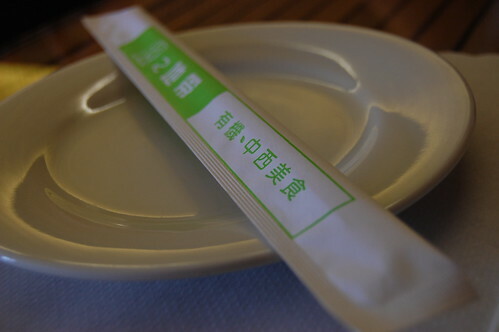 In a recent comment about my photographing food in restaurants, Shan observed, "You seem to have no fear! What's your secret?" No secret. I actually am quite fearless about snapping away in public places. 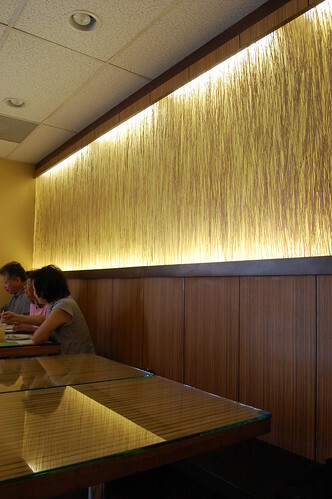 My philosophy is that taking pictures in restaurants is really no big deal, provided you don't disturb other patrons and the people with whom you're dining are ok with it. You just whip out your camera and go. That's about it. If you look uncomfortable with your camera, people around you will feel uncomfortable, too. If you do it with confidence and a smile, it makes everyone feel at ease. Sable Crow documented my food photography insanity on Sunday, so now you can see the method behind the madness. Enjoy! hainan chicken is on my list of warm, fuzzy comfort foods. yum. yay for cranberry! my pear is starting to smell funky, 8 months later. :(. i'm almost done with it at least. SO JEALOUS! 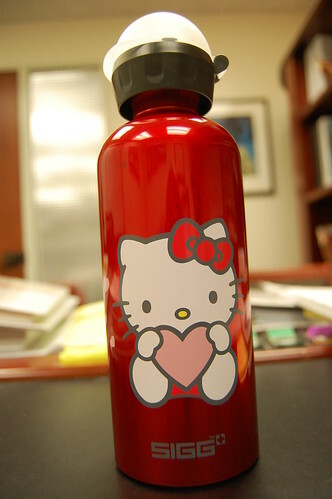 Of your Hello Kitty Sigg. I went to the Sigg website and they have shut down their online shop due to high demand. Guess they couldn't keep up. Boo. Oooh yum, I love hainan chicken. I don't feel uncomfortable taking pictures in public places, though I've noticed that (some) other people that I hang out with sometimes are puzzled by it. 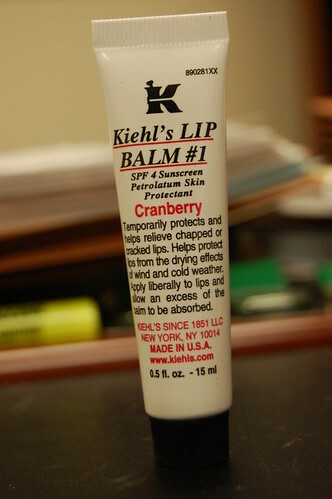 I like kiehl's lip balm, but have never tried the version "with flava"! I must join you and Bax next time! Love your Sigg too. All the ones at Whole Foods look like tatoos--not nearly so happy as yours. And enjoyed Sable Crow's post. So cool to read about a meal from two perspectives amd he seems fun. Flava of Monkey. love it! i heart the herro kitty.